In the world of under-appreciated vegetables, cauliflower has to be near the top. It's one of the red-headed veggie stepchildren sandwiched in between brussels sprouts and cabbage. No doubt recollections of bland steamed vegetable medleys and cauliflower boiled past oblivion have made cauliflower the vegetable non grata in the most kitchens. And while I've eaten my share of dismal cauliflower dishes, at some point along my eating adventures I saw the light — and it was not eating it off a crudité platter dipped in Ranch dressing. I don't recall exactly where or when it was, but it was transformative. I was at one of those mega steak houses where the petit filet is 12 oz and all the sides are a la carte. To their credit, those places usually have delicious and rich side dishes. Garlic mashed potatoes or truffled mac 'n' cheese, anyone? . . . Anyway, I went to pick a side dish and probably because the mashed potatoes and mac 'n' cheese had already been ordered, I got a wild hair and requested the roasted cauliflower. It was a client dinner so I was with a large group. Do you remember that scene in Animal House where Otter, Boone, Pinto and Flounder take their dates to see Otis Day at an all-black bar? There was total silence when they walked in, and the bar inhabitants gave the fraternity boys a look like, "Are you white boys crazy?!" It was pretty much like that when the people around the table heard I ordered cauliflower. I'm known to have a pretty discriminating palate so no one ridiculed me openly but I could tell they thought I'd lost my mind. The point of the story is that the cauliflower dish was the first thing devoured and seconds were ordered. In short, it was adored. There are so many ways to adore this funny-looking crucifer: whipped with mashed potatoes, layered in a decadent gratin, simmered in a spicy curry served over coconut rice, or simply slow roasted in the oven. But one of my favorites is a beautiful pureed soup that could inspire poetry. It's light yet rich, layered with luxurious textures and flavors. While I don't use this word often to describe food, this soup is opulent. There is just no other way to describe it. But it's also like a woman who rolls out of bed and looks stunning with no make-up on. Effortless beauty. That's what this soup is. Saute bacon in heavy saucepan over medium heat until golden brown and some fat renders. Add onion, celery and garlic. Cover and cook until vegetables are soft, stirring occasionally, about 7 minutes. Add cauliflower, 3 1/2 cups chicken broth and cheese cube. Bring to a boil. Reduce heat to medium-low, cover and simmer until cauliflower is tender, about 20 minutes. Puree soup in batches in processor (or use an immersion blender and leave in the pan). Return to pan and add cream. Bring soup to a simmer. Thin with more broth as necessary or desired. Season with salt and pepper if necessary. Wash and dry scallops and lightly salt and pepper them. Sear them for 1 1/2 minutes in a hot skillet drizzled with olive oil. Flip them over and cook another minute until they are opaque. Don't overcook them. This is what makes scallops tough. And they'll continue cooking when you remove them from the pan. 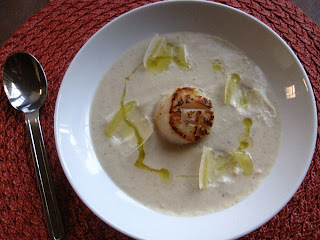 Ladle the soup into shallow bowls and drop one scallop in the middle of the soup. Sprinkle with cheese shavings and drizzle with truffle oil. Yields: Six servings. Notes: I think the bacon can be overwhelming if you're not careful, which is why the applewood smoked bacon is suggested. I would start with 1 1/2 slices first and see how you like it. If you think you want a smokier flavor, I would go with the full 2 1/2 slices but it will definitely have a more pronounced bacon flavor, which I personally wasn't going for. A little of the truffle oil goes a long way, so be judicious with this. You can always add more. If the scallops are particularly large, I usually score them so they'll cook more evenly. This could be converted into a vegetarian dish by omitting the bacon and scallop and using a good vegetable broth. It would still very rich in flavor. The soup can be made a day ahead. Cool slightly; cover and chill. Rewarm slowly and then add the cheese shavings, truffle oil and scallop. I steam them in the microwave for about 8 min. Then process them in the food processer like you would mashed pototoes with butter, 1/2 and 1/2, grated cheddar, salt and pepper. Yum!